Huntkey presents the X-MAN 90W Car Charger, a universal notebook adapter with a 2A USB port for charging mobile devices. 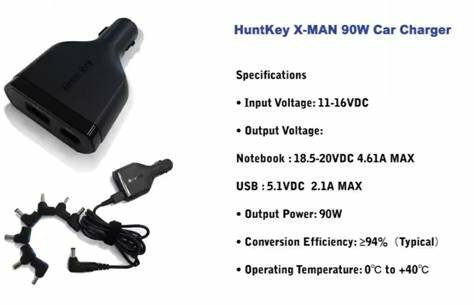 Huntkey Enterprise Group, a global professional power supply provider, is introducing their latest in-car power re-charge solution for USB powered devices and most notebooks available on the market today, the Huntkey X-MAN 90W Car Charger. Its compact and integrated design allows for a small size of 89 (l) x 52 (w) x 20 (h) mm (1.7 cm). As digital devices have entered our daily lives at an ever growing pace, and we are using them virtually all the time and everywhere, we have already entered an age of augmented reality where it becomes troublesome when we can’t use those devices. Yet, exactly this happens quite frequently especially in a world where we are forced to be more and more mobile. In order to cope with this problem, Huntkey has developed the X-MAN 90W Car Charger allowing you to stay powered even on the move, eliminating the fear of suddenly being unconnected or not having your devices ready when needed. The 5V USB power port delivers 2 Ampere, whereas most others only support 1 Ampere. This in turn means, that not only conventional mobile phones, multimedia devices and digital cameras are supported, but it also charges a wide range of currently available tablet PCs. With 8 exchangeable power-tips the Huntkey X-MAN Car Charger even includes a universal notebook adapter, making it a most flexible and versatile power charging solution for all your digital devices on the move. Supported Notebooks include but are not restricted to: HP/Compaq, Acer/Gateway, Lenovo/Thinkpad, Toshiba, ASUS, SAMSUNG, Sony, Fujitsu and Dell. To stay on the safe side, special protection precautions have been implemented such as Over-Voltage Protection (OVP), Over-Current Protection (OCP), Over-Temperature Protection (OTP) and Short-Circuit Protection (SCP).